Summary: Saturday mostly dry. Saturday night/Sunday morning very wet. Sunday dry. Sunday night chance of severe weather. Saturday looks dry for most of the day until about 5pm in the evening, when rain coming from the south will start to make a mess of things. We are looking at a high of about 78 degrees with a 20% chance of rain during the day, increasing to 100% chance overnight Saturday into Sunday. There is a very little chance we could see a shower during the day, but Saturday night into Sunday is when the rain chances increase dramatically. Here is the NAM4 prediction of what our radar may look like at midnight Sunday. It will be very wet tonight and into Sunday morning. Saturday’s low should drop to about 63 degrees. Sunday starts the day wet, then dries up, then gets wet again. While we will see rain early in the morning Sunday, it looks like things will dry up around noon on Sunday for the remaining daylight hours. Sunday’s high is expected to be 78 degrees with a 50% chance of rain. The SPC has us in a SLIGHT chance of severe weather for Sunday 7am to Monday 7am. This is because there is a chance of severe weather with a cold front that will move in Sunday night and into Monday morning. The main threat appears to be straight line damaging winds and large hail. As of right now it looks like the timing of severe weather may be right before dawn on Monday morning. 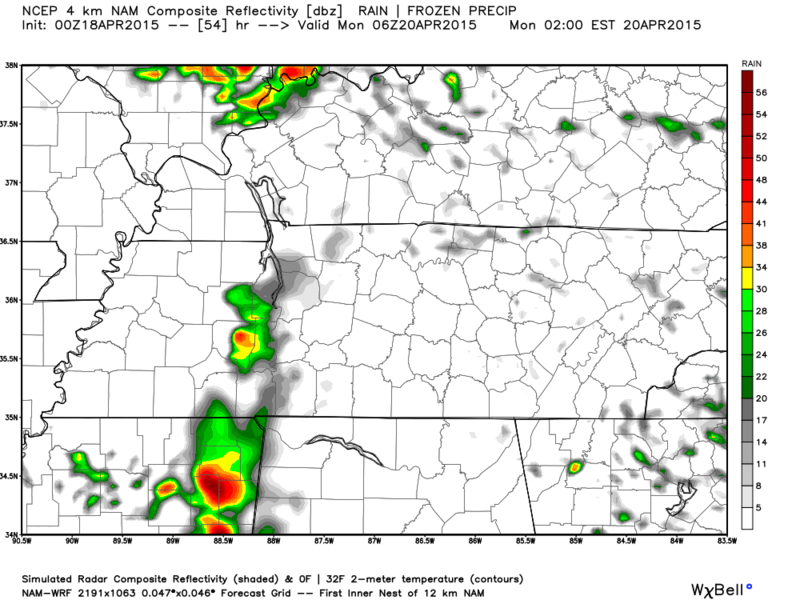 The NAM4 model is predicting a line of storms to our west at about 1 am in the morning on Monday. Doesn’t look too impressive right now, but that is likely because it is still about two days away. While the front is pushing through, things could get a bit gusty with the winds at about 10 to 20 mph. As things progress with this system and more forecasting models are out, we will update this post today if necessary. Midweek break in rain, then thunderstorms return. Monday during the day, Tuesday, and Wednesday during the day see a break from the rain for the most part, but rain chances come back Wednesday night and go through the rest of the week.